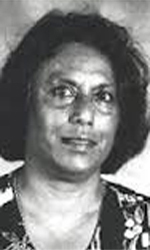 Shanthivathie (Shanthie), the eldest of five children of Ama and Thambi "Naran" Naidoo, was born in Pretoria, Transvaal (now Gauteng) on 6 March 1935. She spent her childhood with her maternal grandmother in Pretoria. At school, Shanthie was involved in organising school boycotts and distributing leaflets. She attended mass meetings at the Red Square, Fordsburg, Johannesburg where the Oriental Plaza now stands. In her youth, she was active in the Transvaal Indian Youth Congress and then in the Federation of South African Women (FEDSAW) which was established in 1954. After the death of her father in 1953, she worked as a clerk in the office of the Congress of Democrats, an organisation of progressive Whites allied to the African and Indian Congresses, until it was banned in 1962. She then went to work for the South African Congress of Trade Unions (SACTU) but was forced to give up that job after eleven months, in December 1963, when she was subjected to restrictions under a five-year banning order. Her brother Indres Naidoo had been imprisoned approximately eight months before she was banned, so she became the main breadwinner for the family. She managed to find a job in Vanguard in a small bookshop. Shanthie was arrested on 29 February 1965 on the charge of contravening the banning orders. She had gone to court to attend the trial of the late Bram Fischer, a jurist and Chairman of the South African Communist Party (SACP). Bhana Mohamed, who had been banned, greeted her and she held her finger to her lips to warn him that she was also banned. For that, she was charged with "communicating with a banned person” and held in jail overnight but was acquitted. On another occasion, when she fell ill and was taken to a hospital, the Security Police went to her bedside and threatened her for not reporting her "change of address" as required by the banning orders. She hoped that the restrictions would be over in December 1968 but, instead, she was served with orders that were more stringent for another five years. Shanthie was banned again in 1968 and was then detained in 1969 under Section 6 of the Terrorism Act and held for two weeks at The Fort in the women’s section of the prison. She was in solitary confinement throughout and was not allowed to shower or a bath. Water was brought to her and she not even allowed to empty her own bucket. She then decided to leave for Britain, where her younger sister, Ramnie, had gone into exile, in the hope of finding a job and leading a more normal life.”. Until then, the regime was freely granting “exit permits” to opponents of Apartheid, depriving them of citizenship and prohibiting their return to South Africa. Shanthie was refused the “exit permit” though she had never been convicted even by an Apartheid court. On 19 June 1969, Shanthie was detained under the Terrorism Act without any charges and kept in solitary confinement. Neither her family nor her lawyer could visit or communicate with her. Her family did not even know where she was held. They engaged a senior counsel and made representations to the authorities that she would leave the country immediately if she was released, but in vain. Shanthie was interrogated for a whole week without sleep. The person in charge of interrogation was the notorious Swanepoel who shot her brother, Indres Naidoo. She was brought to the court on 21 December 1969, to give evidence in the trial of Winnie Mandela and 21 others who were charged, after several months of imprisonment, with furthering the aims of the African National Congress (ANC). That was the first time the family could see her since she was jailed and they learned that she was now imprisoned under a law that allowed the police to detain anyone who can be a potential witness in a case. She was made to stand for long periods of time and towards the end she lost consciousness with reality and began to hallucinate. On the fifth day, she was allowed to sleep for a few hours. When she got up she felt like there was no floor anymore, and she described it as the most horrible feeling. The police then took her to Pretoria Central Jail and left her in solitary confinement conditions which were similar to her prior experience at The Fort. Six months later they took her to give evidence in the trial of twenty two, amongst whom were Winnie Mandela and Joyce Sikhakhane. Shanthie refused to give evidence and was subsequently to two months imprisonment. She was referring to Winnie Mandela and Joyce Sikhakhane, a journalist. I was forced to stand for five days and nights, while they fired questions at me. I lost all sense of time. I only knew it had been five days when they took me back to the cell and the wardress told me what day it was. I also began to lose hold on reality towards the end of the interrogation. I had terrifying hallucinations, like nightmares, in which the questions became all mixed up with broken dreams. I didn’t know what was happening. The police also threatened her that her whole family would be detained if she did not make a statement. Finally, she made a statement to the police but refused to give evidence in court. The judge in the case, Mr. Justice Bekker, ruled against Shanthie and declared:"It is obviously unpleasant to be called upon to give evidence against friends. Your excuse is a moral one but, in my opinion, is not a just one”. He sentenced her to two months imprisonment and warned her that she would be sentenced again to one year if she continued to refuse to give evidence. On 16 February 1970, the Attorney-General stopped the prosecution of Winnie Mandela and others for lack of evidence. There was now no need for evidence by Shanthie, and her mother made an urgent application to the court for her release. The police, however, told the court that they were again detaining Shanthie under the Terrorism Act and that the court could not order her release. Shanthie was not released until June, after 371 days in prison, most of it under solitary confinement, for no offence but her ordeal was not over. She again applied for an exit permit to leave South Africa and was happy to receive it from the Minister of the Interior in March 1971. Since she was restricted by the banning orders to the magisterial district of Johannesburg, she needed permission from the Minister of Justice to go to the airport on the outskirts of the city. She applied for permission but was refused. She was the first South African to be placed in this situation. Robert Sobukwe, the leader of the Pan Africanist Congress (PAC), was the only other person so confined. ‘So it is back to square one. So Shanthie Naidoo goes on with her work in a city bookshop and waits for what will happen next. She reports to the police every Monday between 7 a.m. and 7 p.m. She is careful not to attend social gatherings and not to speak to any of her old friends who may be banned. She may not publish her feelings in writing, nor communicate them to any newspaper. She could not attend the wedding of her younger brother or the funeral of a close relative. She could not talk to her closest friends or go on a holiday. She could not go to Robben Island prison to see her brother, Indres Naidoo, who had been jailed for ten years. Shanthie applied to the Supreme Court in Pretoria to be allowed to leave the country but it ruled against her. She appealed to the Appellate Division of the Supreme Court, and it also ruled against her in December 1971 and ordered her to pay the costs of the hearing. Finally, in September 1972, after international pressure and the intercession of Helen Suzman, a liberal Member of Parliament, she was given permission to leave South Africa. She was also allowed, for the first time, to visit Indres in prison. Relatives and friends quickly collected money for the fares and the court costs so that she could leave immediately. More than two hundred people of all racial origins went to the airport to bid her farewell and sang "We Shall Overcome.” She had to say good-bye to one person at a time because of the banning order. She went to the United Kingdom, where she worked for a short while for the Soviet Weekly and then at the International Defence and Aid Fund in London for many years. She was active in the ANC. She later worked at the Solomon Mahlangu Freedom College, established by the ANC in Morogoro, Tanzania. During this time, she also worked for the ANC Women’s Section and SATIS, a society dealing with people detained, tortured and sentenced to death. They organised petitions, marches and all-night vigils outside South Africa House. In 1980, Shanthie and her fiancé, Dominic Tweedie, a British anti-apartheid activist, went to work at the ANC school, at Mazimbu, Morogoro in Tanzania. Shanthie worked in the Principal’s office while Dominic, a woodwork specialist, was involved with the design and construction of the settlement at Morogoro. Shanthie and Dominic married during their year in Tanzania. She returned to South Africa in April 1991 with her husband, Dominic Tweedie, where they live. • E.S. Reddy. (2012). From an email to SAHO, from Mr E S Reddy, dated 30 June 2012.